SALT LAKE CITY, Utah (September 29, 2014)- Following an impressive debut for the team in which they took victory at the Mobil 1 Twelve Hours of Sebring, Marco Seefried will once again return to Magnus Racing for this weekend’s season-ending Petit Le Mans. Seefried, hailing from Germany, will be competing in his first ever 10-hour classic. Beyond his victory with Magnus, the 38-year-old is a veteran of sports car competition around the world. In addition to previous U.S. events in the former American Le Mans Series, Marco has extensive experience in international series such as the Blancpain Endurance Series, VLN, GT Masters, and Porsche Carrera Cup. As the final round of the TUDOR United SportsCar Championship, the debut season for the series, Magnus Racing looks to put a strong stamp on their year. Following a difficult summer season, the team recently showed renewed form at the most recent round in Texas, where the No. 44 Flex-Box Porsche 911 GT America set the fastest race lap en route to a second place finish. The team’s renewed form is also directly related to a series of tests conducted three weeks ago at Road Atlanta, the very circuit they will be returning to. Living just a few minutes from the circuit, former Petit Le Mans winner Andy Lally also looks to end the season on a high. Practice for Saturday’s event begins Thursday, October 2, with Saturday’s 10-hour race taking place at 11:15 AM ET. Live coverage for the event will begin on IMSA.com at 11:00 AM ET, with FOX Sports 2 taking the race on at 3:00 PM ET. Additionally, Sunday will carry a highlighted re-broadcast on FOX, airing at 8:00 AM ET. AUSTIN, Texas (September 22, 2014)- After an unusually quiet summer season for Magnus Racing’s 2014 campaign, a strong second place would highlight the team’s return to form during Saturday’s Lone Star Le Mans, the penultimate round of the TUDOR United SportsCar Championship. On the heels of a series of tests during the recent break, the strength of the No. 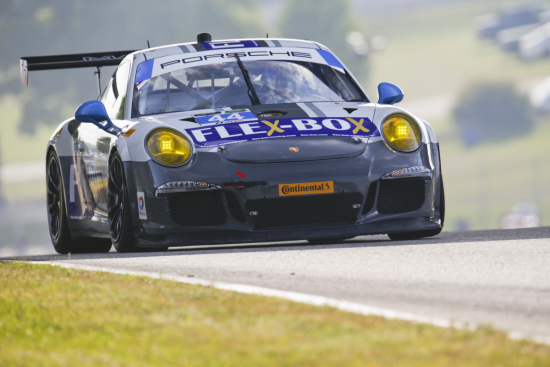 44 Flex-Box Porsche 911 GT America was evident following the week’s practice and qualifying sessions. Repeatedly setting times in the top-five, the team quietly knew they were in contention for Saturday’s round. Starting from the seventh position in the race, John Potter would take opening duties during the day’s two-hour, forty-five minute race. While Potter is known for driving calculated and patient stints, the Utah resident’s outright pace was particularly strong, setting a series of fast laps and maintaining position throughout the majority of his run. When an opportune caution period would come out just under the one-hour mark, Potter was able to bring his car in for full service and a driver change, walking away knowing he’d completed one of his best drives to date. With teammate Andy Lally behind the wheel, all attention was turned to getting the team in podium contention. Making immediate work of the field in front of him, Lally converted his seventh place position to fifth as his stint wore on, and even turned the fastest lap of the race on Lap 29. As the laps wore on, the team would elect to make their last stop with just under one hour to go. While Magnus Racing is known for their quick pit work, Saturday’s stops were a true testament to the team’s reputation for quality. As the stops cycled through the field, the team once again advanced several positions, the only cars in front of them being the race leader and two other marques who seem to have a quicker process for filling fuel, which is something out of the team’s control. When an incident involving the race leader would occur, Lally found himself in third, gaining ground on the second-place BMW and knowing he had a car capable of winning. Following a spirited duel for second, the Magnus Porsche would gain the position with just 20 minutes remaining, with all focus now on the leader. Unfortunately, the Georgia resident simply ran out of time to catch the race-winning Viper GT3-R, settling for second in front of an elated crew. Sharing a sentiment similar to his teammate, Lally was very enthusiastic following the event. With practice beginning in just over one week for the final round of the year, the famed Petit Le Mans at the Road Atlanta circuit, the team is hard at work to get prepared. Official practice begins on Thursday, October 2, with the race beginning at 11:00 AM ET on Saturday, October 4. ALTON, Virginia (August 25, 2014)- Taking part in the first-ever GT only race for the TUDOR United SportsCar Championship, Magnus Racing used a combination of strategy and patience to take sixth place during Sunday’s Oak Tree Grand Prix at VIR, the ninth round of the GT Daytona (GTD) category. After several strong showings in practice, the No. 44 Flex-Box Porsche 911 GT America would qualify seventh for Sunday’s round, with the team’s race-long pace looking strong for the event. Unfortunately, the day turned for the team before the race even began, as John Potter’s opening stint was marred by an electrical issue that forced him to start from the back of the field. Regardless, the Salt Lake City resident did his usual steady drive of coming up from the back, demonstrating both pace and patience as he moved up several spots during the opening hour, threatening for the top-10 as the laps continued. Adding to the challenge, the team owner was under pressure to save fuel throughout his stint while maintaining lap times in order to ensure he had enough fuel to make his minimum drive-time of one hour. As the one-hour mark came and the team began to run short on fuel, a timely yellow would allow Potter to close in on the field in front of him before the first round of stops. Unfortunately, under yellow flag conditions the field is not allowed to pit until the series declares the pits open for each category, which meant the No. 44 would likely not be able to make it with the fuel that remained. As a result, the team pit for an “emergency” stop in a closed pit, which is allowed so long as it’s just for a few seconds of fuel. Following a successful emergency stop, and then followed by the “real” stop for a driver change, as well as tires and fuel fill two laps later, Andy Lally now found himself looking strong to hunt down the field in front of him. Unfortunately, a bit of confusion between the series and the team would lead to a stop-and-go penalty for Lally as the field went to green, meaning he would resume racing several seconds down. Doing his best to catch the field in front of him, attrition and outright speed would advance Andy to eighth as the race went on. The final key moment of the race would come with one-hour and ten minutes remaining, when yet another caution would come out and place a crucial decision on each team’s strategist. With the field bunched under yellow, the caution period presented a perfect time for all teams to make their final pit stops, however in doing so the teams would be running very tight on fuel to make it to the end of the race. On one hand, if the team stopped there would be a chance they may have to make another stop versus the teams who stayed out and pitted later. On the other hand, if the team played their fuel mileage well, they would manage to advance over anyone who chose to pit later. Opting to make the stop, Lally came out of the pits aware of the situation, and would spend much of the final hour saving fuel. As the race wore on and several cars would stop in front of him, the team’s calculations showed that they would likely be in a good position to make it to the end, and based on the pace of the field in front of them, many cars in front likely would not. As a result, the team looked strong to advance several spots in the closing laps, however it was all for not as a late race caution would ensure everyone could go the distance. Once the racing resumed, Lally would hold station to finish sixth. This would serve as yet another top-10 on the season, and hopefully change the momentum heading into the final two rounds. Concluding a busy summer season for the whole of the series, the events will continue in four weeks’ time at the Lone Star LeMans, a dual event with the World Endurance Championship taking place at the prestigious Circuit of the Americas. Practice will begin on Thursday, September 18, with race coverage on FOX Sports 1 on Saturday, September 20. SALT LAKE CITY, Utah (September 17, 2014)- With only two rounds remaining in the TUDOR United SportsCar Championship, Magnus Racing will head to this weekend’s Lone Star Le Mans with one thing in mind, the movie Spaceballs. Lone Starr, the main character of the 1987 Mel Brooks classic, is a very fitting tribute to this weekend’s event. Not only was he played by Bill Pullman, who is relevant in any context, but the character spent the majority of his time dealing with a whiny princess, sort of like the IMSA paddock. Beyond Spaceballs, the team looks forward to a promising weekend ahead. Having recently conducted a two-day test where they were able to work on such elements as a new exhaust, active suspension, and even turbo kit, the team feels as prepared as ever. Having narrowly missed victory during last year’s event, drivers John Potter and Andy Lally are looking for a return to victory lane in the No. 44 Flex-Box Porsche 911 GT America. For co-driver Andy Lally, a similar sentiment is shared. Sharing the weekend with the prestigious World Endurance Championship (WEC), practice for this weekend’s Lone Star Le Mans will begin tomorrow afternoon, with live race coverage this Saturday, September 20, at 12:30 PM ET on FOX Sports 2. SALT LAKE CITY, Utah (August 22, 2014)- When Magnus Racing last competed at Virginia International Raceway as part of the GRAND-AM Rolex Sports Car Series in 2011, the fledgling team came in to VIR with something to prove. Up to that point in their history, the team had only one podium to its name, having earned third at Homestead-Miami Speedway just a few months earlier. With the long straights and tricky corners of VIR keeping the field pretty even, a series of rain showers in 2011 would put a premium on strategy and driving as the track dried. With the laps counting down, Magnus Racing found themselves within grasp of the checkered flag in a solid second place until the skies opened up and the car would end up spinning in to the barriers in the wet conditions. The team would drop down the order in to a 15th place finish. In the throws of a difficult championship fight, Magnus remains a quiet contender with only three races remaining, just a few points out of the lead in a very hotly contested fight among the top-six. With this weekend’s first-ever GT only race for the TUDOR Championship, Magnus Racing and the entire GTD field will share the track with the faster GTLM category, setting up for what should be an interesting event. Television coverage begins this Sunday, August 22 at 4PM ET on Fox Sports 1.